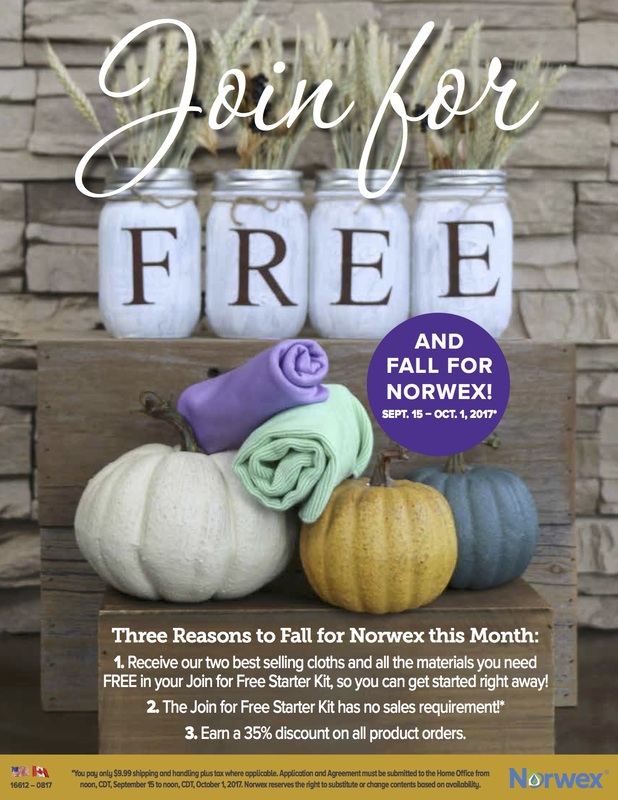 Join for FREE as a Norwex Independent Sales Consultant from September 15, 2017 until October 1, 2017!!! You will qualify for the JOIN FOR FREE Starter Kit without any sales requirement. There are no strings, no obstacles, just a FANTASTIC opportunity for everyone who has an interest in starting their home-based business today! How much does it cost to get started as a Norwex consultant? Can I earn an income immediately? Who pays for all of the free hosting gifts? Can I do this as a casual consultant? It’s the start of September and your kids are going to school with their bags packed with brand-new school supplies and sharpened pencil crayons, they are excited for the start of their fall school year with brand new books, binders and shoes and they feel all the potential welling up inside them for an awesome year and expectations for all the effort they will put forth for their success. And you can do the same. When you start with Norwex, you will be part of a company that equips you with the tools you need to get you home-based business started. In my 11 years of experience, fall is the best selling season! It’s a great time to sign up, especially if you love the product, have a heart to teach others about green clean, natural cleaning products and are willing to learn. But, success doesn’t happen by accident. 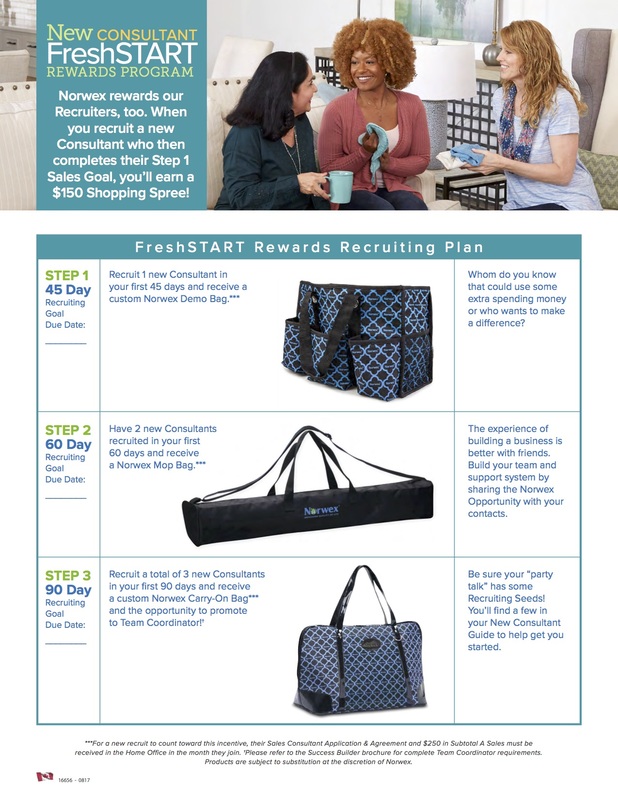 The first step is to sign up and take advantage of all the great things Norwex has in store for their new consultants, like you! The next step is to accumulate product to demonstrate at your presentations. 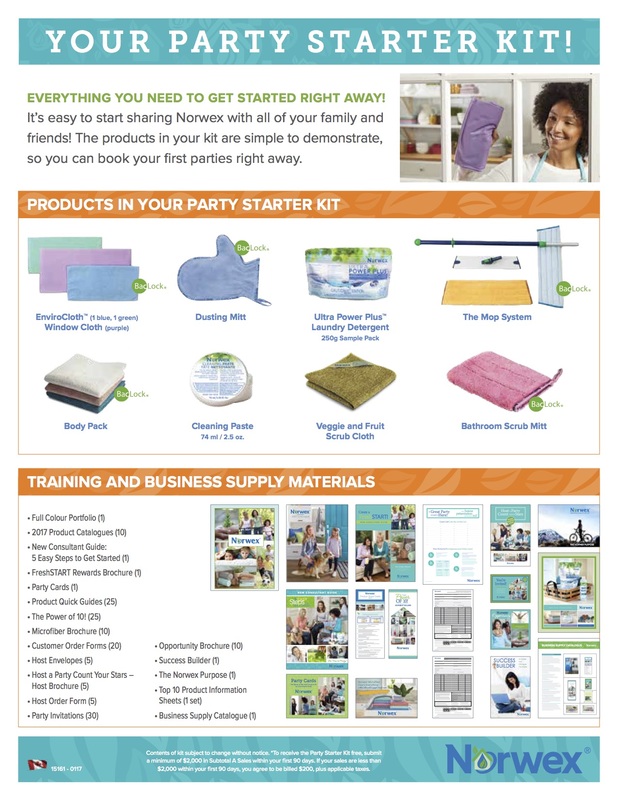 Norwex offers each new consultant a “Party Starter Kit” to get your parties and your business started. It offers the best-selling, most well-known items so that you are equipped from day one to demonstrate how Norwex products work so that people will buy. It is much more convincing to sell a Veggie & Fruit Cloth when you take out a few dirty carrots and quickly scrub them in your host’s sink, then to talk about the cloth. People will see that it works and that their time spent prepping carrots will be 75% faster than peeling and washing. I love the Veggie Cloth. Demonstrations open the conversation up to answer questions about other products and why and how they work. 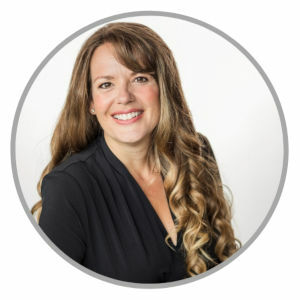 The Party Starter Kit is full of great products and business supplies and is FREE for new consultants who sell $2000 in the first 90 days of your business. Consider this your first business goal! It is attainable, as the average party sells $500. As a Norwex consultant, you make your commission on your first sale. When you sell $2,ooo of product, you’ll earn 35% in commission that is $700. 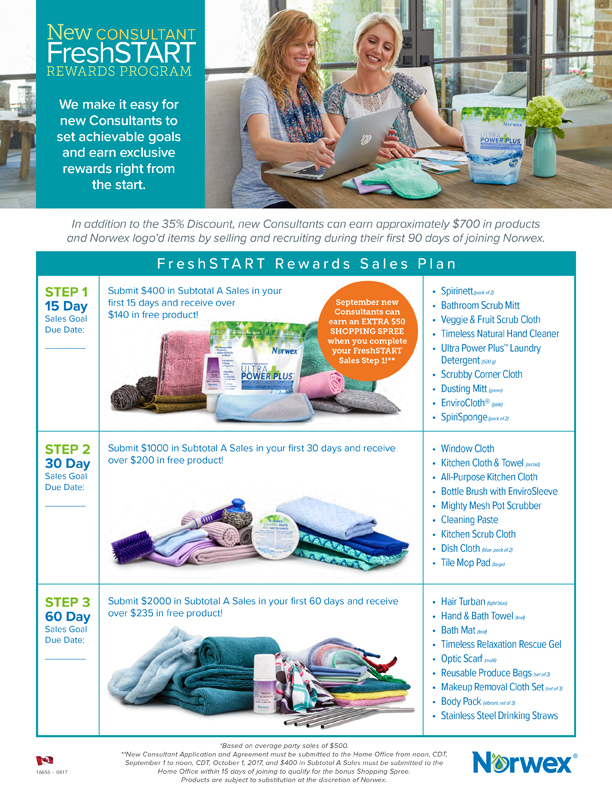 Plus, if you choose to sell $2,000 in 60 days, Norwex will give you over $560 in free product from the FreshStart Program (keep reading), plus the Party Starter Kit that is worth over $300! If you have a slow start and don’t sell $2,000 in your first 90 days, the kit will only cost you $200… a small investment for your business potential. The more product to demo, the better! I love watching customers at my presentations get more and more excited as they see that Norwex has solutions for every area of their homes. The more product you demonstrate the more choices people have to buy. This month, the upgrade includes lots of the newly- released product, so you will be equipped to showcase new product (as well as the favourites) at your launch party! Check out this month’s opportunity to upgrade your Party Starter Kit for a GREAT price. Another step to achieving success as a Independent Sales Consultant, is to set aside time to succeed and set goals to keep you accountable. The Norwex FreshSTART program is a spring board for this type of thinking and they reward you along the way. 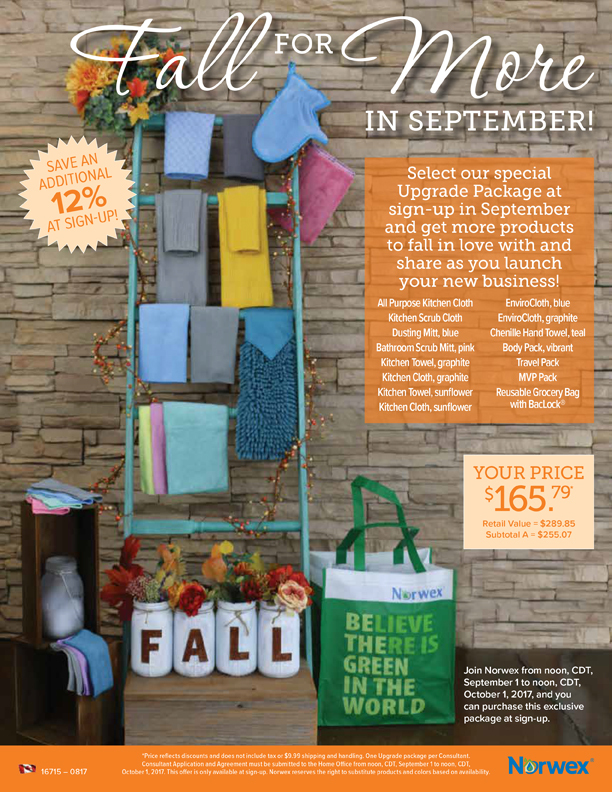 This month they are offering approximately $700 in products and Norwex logo’d items by selling and recruiting during your first 90 days of joining Norwex. Plus they are offering an EXTRA $50 Shopping Spree for completing the first sales/recruiting goal.